Property Size 300 sq. ft.
At Mango Hideaway you can savor the peace and quiet of your private deck with Jacuzzi. The kitchenette is stocked with essentials including a full size fridge with ice maker and microwave for light cooking and in-room entertaining. Relax in the shared pool one block away. Off street parking on first come basis. You must request parking at time of booking. 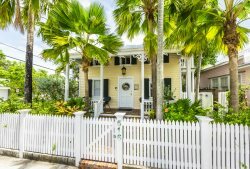 Guest must check in at Key West Hideaways 828 White street. is perfect to walk to everything. Relax in the shared pool one block away. Off street parking on first come basis. You must request parking at time of booking.